And all happens with Partial Page Refresh – only the contents of the table, or perhaps the layout of the table but nothing beyond that is refreshed, as to provide the user with a very smooth experience. It makes the table or data grid look a little more like Excel – and isn’t that what all users want to have? Well, it turns out it was all true. In the JDeveloper 11g Technical Preview we can try it out for ourselves. And the best part of it: it is dead easy to use. Basically a simple drag and drop used to give you the ‘old’ ADF Faces table, now gives you the new one – with all these features enabled. If you want them. Note: the column ordering is more advanced than it used to be; now you can select whether to order ascending or descending directly, instead of first ordering (getting ascending) and then ordering that column again (to get descending). Also note that the pagination – step through the records, showing a page full at a time (showing 10-19/29281) – is no longer required. 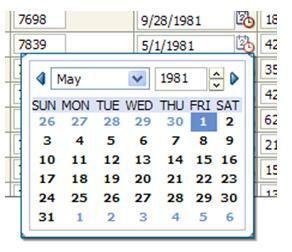 The table has stepless data scroller capabilities that will fetch additional records when the client requires them. This means that the user can scroll through a table as if all records were loaded upfront while in fact they are loaded as needed. I create a new JSF page, accepting all defaults. I set Filtering (new) and Sorting to true and remove a few columns. The table is displayed in the WYSIWYG editor. I can do some additional configuration, such as setting the width (which in my installation seems to default in the browser to a little under 300 px). Also note there is quite a bit of Behavior we can set. 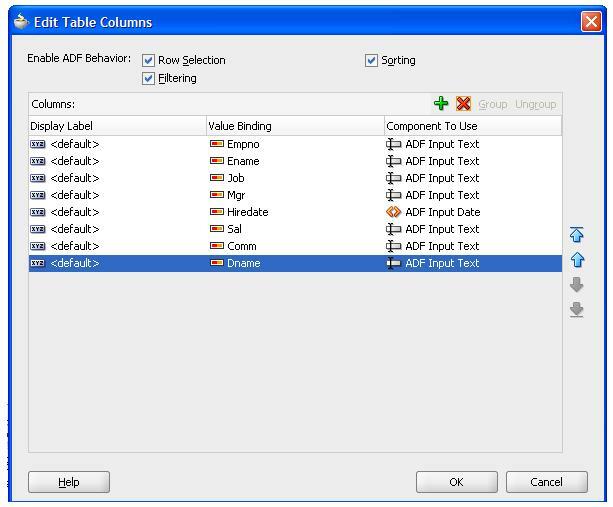 For example to enable or disable column stretching, to set the fetchsize for the data scroller and to disable column reordering. Also note how dragging the ADF collection took care of setting the FilterModel and QueryListener. Especially the last one, used with the Filter option that allows us to filter the data in the table by setting conditions on columns, is pretty powerful. We can reposition columns, resize columns, scroll through the data, re-order the data and filter the data by applying column filters. I can do that on JDeveloper 10.1.3.1.0? If I can’t, can you tell me a nice and easy way to do it?